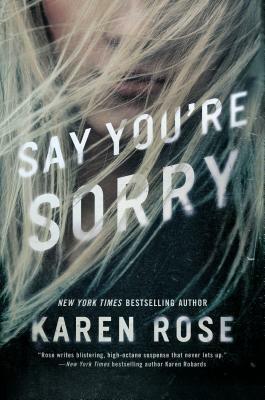 Say You’re Sorry by Karen Rose– Special Agent Gideon Reynolds has tried hard to put his past behind him. He escaped the violence of his cult upbringing when he was just thirteen, and since then routine and discipline have been his way of making sense of the world. But when a petite blonde woman crashes into his life, he begins to realize that a little bit of chaos might not be so bad. Daisy Dawson has had more than her fair share of pain too—but she’s done being a victim. Daisy’s determined to explore every new experience she can—including getting to know the dark and serious FBI investigator she meets when she fights off a masked attacker one night. It soon becomes clear that Daisy’s attack was just the beginning. Now the bloodied bodies of young women are showing up all over California, and, as Gideon tries to find the killer, it’s clear that Daisy is in more danger than they ever realized. My Thoughts: This book is going on my 2019 favorite reads list for sure! I was drawn into the story immediately and it kept my full attention for the entire time. It was the perfect balance of suspense and romance- and that’s hard to achieve! The suspense was heart-stopping and the romance was enough to make you swoon! The entire book is graphic and raw- both the suspense and the romance! I loved Daisy’s character. She had many layers- strong, fierce, and broken- all wrapped into one person. It was impossible not to root for her! The relationship between her and Gideon was deep and real and intense. I loved them as a couple. This is a long book (568 pages according to my Kindle app) but it was such a great read that every single page was necessary to the story. I cannot wait for the next one in the series!